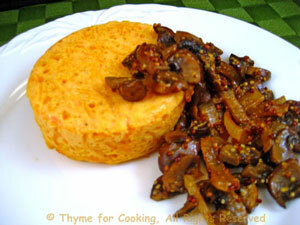 Timbales of Butternut Squash, Savory Mushroom Sauce, Thyme for Cooking . The savory onions and mushrooms are a nice contrast with the slightly sweet butternut squash. Butter 2 ramekins and line with buttered parchment or waxed paper (see Miscellaneous Tips). Clean butternut squash and shred part of it using the smaller holes on a box grater. You want enough to almost fill the ramekins very loosely. Add butternut squash, cheese, mustard, nutmeg, salt, milk and mix well. Spoon into prepared ramekins. Cover with the top circle. Put into a roasting pan with deep sides - I use a metal bread pan, and add hot water (hot tap water is fine) so that it comes half way up the sides of the ramekins. Bake in 400F (200C) oven for 30 minutes, until set - top will be firm. Remove from oven and carefully remove ramekins from hot water. Remove paper. Run a knife around edges of timbales and invert onto small plates. Remove paper. Spoon Mushrooms on the side and serve. Heat oil in a medium skillet. Add onions and sauté over high heat for 5 minutes. Reduce heat to medium-low and sauté until very tender and starting to caramelize, about 15 minutes longer. Add mushrooms and increase heat to medium. Sauté 5 minutes. Add stock, mustard, heat until reduced and thickened.